The growing availability of ready to use shake‘n‘bake kits on the market increases the potential of manual handling errors and the risk of high radiation exposure to the operator. With the KitLab, Eckert & Ziegler offers an automated solution to improve the reproducibility of results and to prevent users of unnecessary exposure. KitLab combines fast user setup, easy handling and elimination of operating errors; therefore allowing more time to stay focussed on other work. The use of defined tools for each kit and the reproducible process make KitLab very reliable. So far the system has been tested with the IsoPROTrace-11 kit and can be used for radiosynthesis of 68Ga-HBED-PSMA without kits. APPEAL TO KIT MANUFACTURERS: Benefit from our experience to deliver state of the art programming and contact us with your kit development project. Get in touch! After connecting the KitLab device to the standard socket outlet, putting the RFID card in place and inserting the cassette, the system is ready for use. 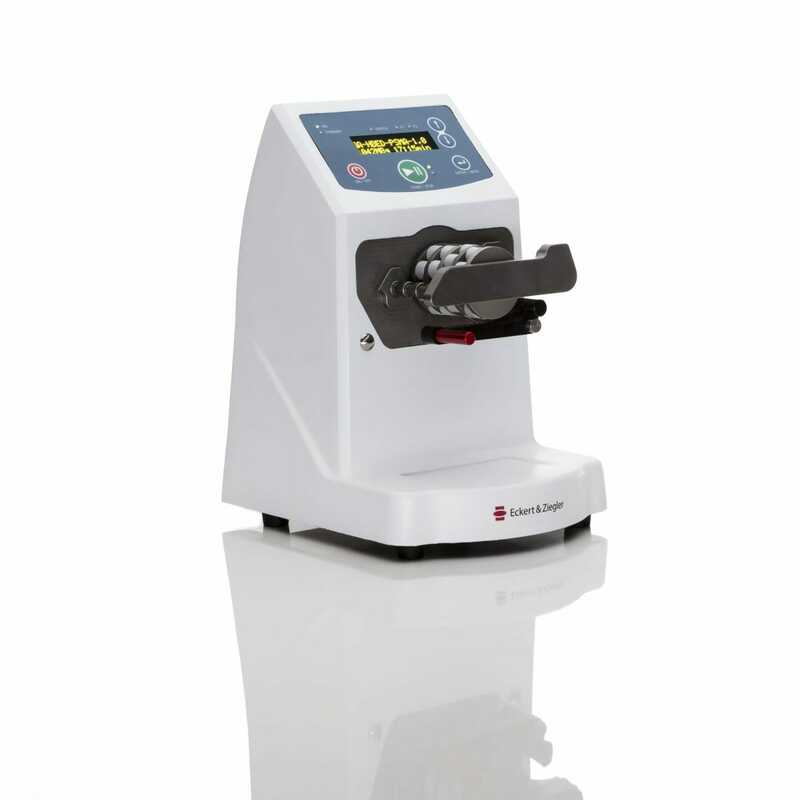 For the transport of liquids KitLab uses the established and well proven peristaltic pump with four independently programmable channels. In addition to performing automated handling of registered kits the device offers the possibility to start a program with time delay function to allow an automatic pre-elution at a scheduled date and time. The cassettes are delivered with an RFID card that contains important information for the batch report. All data will be gathered via the RFID card reader and the optional barcode scanner and stored on the device itself. The data is combined in one batch report which can be directly printed with the optional label printer. To secure GMP-compliant data storage, batch data are subsequently stored on the internal SD card and additionally on the cassette-specific RFID card. All batch data can be accessed at any time. The cassettes are assembled under GMP compliant clean room conditions and sterilized with gamma-radiation. They come with needle free connections and V-vials to minimize residues. Color coding between vials and spikes prevents incorrect use and facilitates the preparation process. The cassettes are delivered with all further necessary consumables. 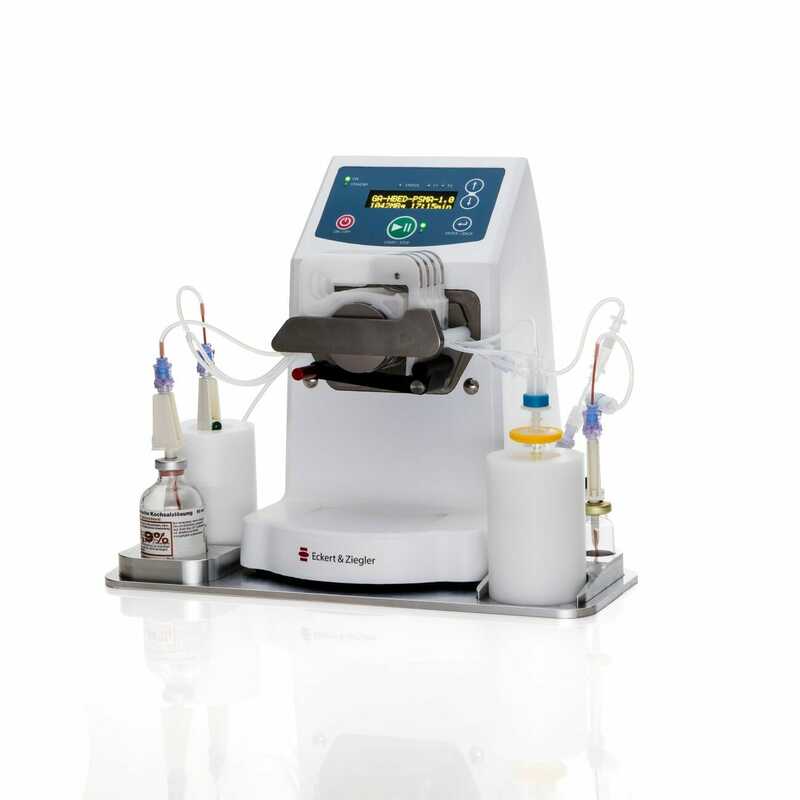 The KitLab system was initially developed for a synthesis with 68Ga-HBED-PSMA including pre- and post-purification steps. The system is upgradable for licensed kits, e.g. with a novel heater module. The programming of KitLab is done by Eckert & Ziegler. If you wish to customize your device with a special application get in touch! 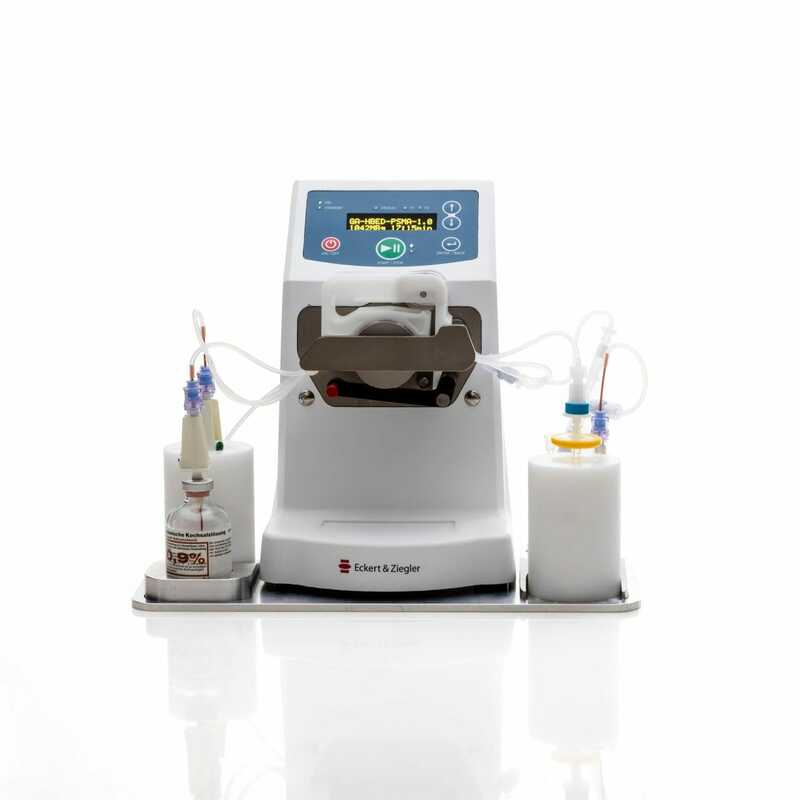 Eckert & Ziegler offers a wide range of radiosynthesizers: Modular-Lab Standard is a tubing-based system and has been specifically designed for research and development of radiotracers, whereas Modular-Lab eazy provides a space and cost efficient solution for cassette-based routine production of Theranostics tracers. Modular-Lab PharmTracer also follows the cassette-based approach and can be used for GMP-compliant routine production as well as research purposes.